What does Female Empowerment mean to me? To me, female empowerment means realising your potential, taking back your body, your ideas - rejecting the narratives in which the woman is a fetish more than a human. It means recognising the double standards in society and in semantics. Starting with the words used to describe us: aggressive, when being assertive; bossy when we're leading, whiny when critiquing, difficult when rejecting, redefining, the status quo. It means recognising the problem, stepping up and doing something about it. Unfortunately, many people think that Female Empowerment started in the late 19th century with The Suffragettes movement for women's right to vote. However, in history there have always been women that either with a pen or with their own fists, have fought against oppression. Think of Wu-Zhao, who raised from concubinage to Empress of China (690–705); or Éléonore D’Aquitaine, who’s tenacity, political wisdom, and voracious energy made her become the most powerful woman in 12th-Century Europe. Read about Claire Lacombe, The Heroine of August Tenth, who in 1792 during the Paris insurrection, continued her fight with the rebels, even after being shot through the arm. What about Rosa Parks? Her refusal to give her seat on a bus to a white man, became the spark that ignited the U.S. Civil Rights Movement. History is filled with brave women that fought for their rights, and it’s our duty to learn about them. Without these women, would things have been different for us now? Would we have overcome the limits imposed by society, by the law, by our loved ones? I think we would have. I believe that even without these heroines, others would have risen and taken their place. Let’s not forget that Rosa Parks was not the first black woman to refuse to move from her seat; Claudette Colvin had done the same nine months before her, and before them, countless women did the same. If there is something that history teaches us, it is that you can kill a man, you can kill millions - but you can never kill an idea. Women of all colours, personalities and backgrounds are making history today. The YPJ, an all-female brigade of the Kurdish People's Protection Units fighting against ISIL in Northern Syria, whose role was pivotal in liberating Kobani in Syria and introducing the world to the plight of the Kurds in Syria. Or like our Hollywood cohort who supported the #MeToo movement, founded by Tarana Burke in 2006. In a world in which speaking up often means becoming the object of taunting because, “why did you wear such a short skirt in the first place?”, it takes guts to come forward and fight for justice. 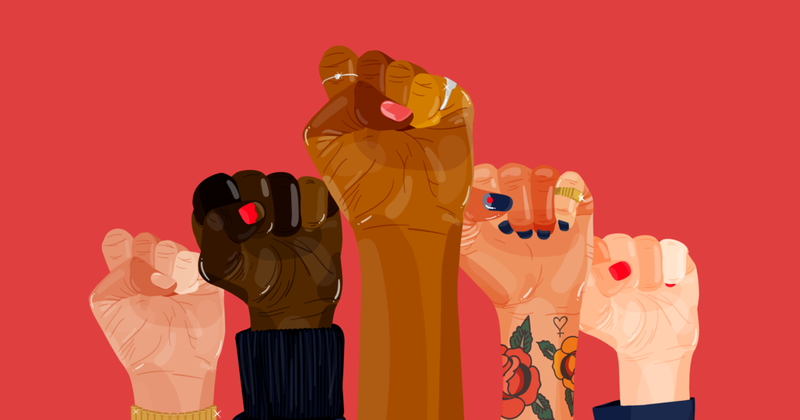 The world is filled with women that empower us everyday, not only historical figures and past heroines, not only artists and fighters; but mothers, friends, sisters, even you and I.
we are love and resistance. We are free to be everything they don’t want us to be. What does female empowerment mean to you? I would love to hear your thoughts.